Well, turns out I was close with yesterday’s ridiculous weather prediction. 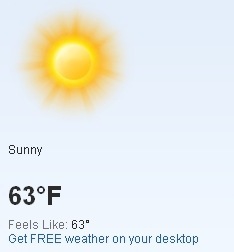 It didn’t quite reach 75 degrees today, but weather.com tells me that it’s currently 63. So, yes, while yesterday it was cold enough that I was afraid my hands were going to turn Morning-Sky Blue, today everyone’s begging the professor to have class outside. Which reminds me of something. Listen, kids, computer science is a fine field to go into if you like sterile, atmospherically-controlled spaces lacking any sort of window. If, however, the out-of-doors genuinely interests you, you might want to think twice. Because you can go ahead and assume you’ll never, ever be having class outside while you’re working on that CS degree. For one thing, those lab computers don’t work so well out in the courtyard. And even worse, your professors are probably even more likely to consider the outside world a hostile environment than you are. Most of mine were damn fine people, but tended to hiss like vampires on the way to their cars every year when spring arrived and the clocks rolled forward again. No one can teach you about binary search trees or the importance of tessellation for graphics processing when they’re worried about turning into a pile of ash. So, yeah, sorry, you’re staying inside today. But, hey, at least you’re preparing for that career. I didn’t get outside today either. In other, probably more pertinent news, the time has once again come to limit my typical, every-day-or-so Posts of Ridiculous Length. I’ve applied a daily word quota to the non-fiction project in progress, which means that in regard to writing time, that comes first for a while. On top of that, I’ve started noodling on the next novel I want to write, and submitting queries for the previous novel takes a not inconsiderable amount time itself. And as always, the family and work take precedence over everything. Now, before anyone starts crying into their beer, this doesn’t mean I’m abandoning you or the blog. It just means that you’re only likely to see, at most, three real posts a week for a while. But don’t worry, I’m feeling pretty good about a whole new slate of limericks, haiku, and stick-people art* to fill the gaps. And if that doesn’t fill you with the tinglies of anticipation, well, I just don’t know what will. Except maybe a taser. Or a meth hit, but neither of those is probably a good thing. Probably ought to stick with what I’ve got for now. PS: I’m open to suggestions for additional forms of short post. I mean, maybe not sonnets or anything, but otherwise, if you’ve got an idea to torture me, by all means drop it in the comments. Next ›What do I think of the new Moerlein Lager House? Glad you asked!